पूर्वी पाकिस्तानी सैन्य कमान का आत्मसमर्पण. इसके साथ ही १९७१ के भारत-पाक युद्ध का आधिकारिक आरम्भ हुआ एवं इन्दिरा गांधी ने सेना कि टुकड़ियों को सीमा की ओर कूच करने के आदेश दिये तथा पूरे स्तर पर पाकिस्तान पर आक्रमण आरम्भ कर दिया।:333  इस अभियान में समन्वय बनाकर वायु, सागर एवं भूमि से पाकिस्तान पर सभी मोर्चों पर हमले बोल दिये गए।:333  भारत के इस अभियान का मुख्य उद्देश्य पूर्वी मोर्चे पर ढाका पर अधिकार करना एवं पश्चिमी मोर्चे पर पाकिस्तान को भारतीय भूमि में घुसने से रोकना था। There was no Indian intention of conducting any major offensive into Pakistan to dismember it into different states. ↑ अ आ इ "Indian Air Force. Squadron 5, Tuskers". Global Security. अभिगमन तिथि 20 October 2009. ↑ "Chapter 10: Naval Operations In The Western Naval Command". Indian Navy. मूल से 23 February 2012 को पुरालेखित. ↑ "Damage Assessment– 1971 Indo Pak Naval War". Orbat.com. अभिगमन तिथि 27 July 2012. ↑ Air Chief Marshal P C Lal (1986). My Days with the IAF. Lancer. पृ॰ 286. आई॰ऍस॰बी॰ऍन॰ 978-81-7062-008-2. ↑ "The Battle of Longewala—The Truth". India Defence Update. मूल से 8 June 2011 को पुरालेखित. ↑ अ आ "Pakistan Air Force Combat Experience". Globalsecurity.org. अभिगमन तिथि 27 July 2012. ↑ "Pakistan Air Force – Official website". Paf.gov.pk. अभिगमन तिथि 27 July 2012. ↑ अ आ "IAF Combat Kills – 1971 Indo-Pak Air War" (PDF). orbat.com. मूल (PDF) से 13 January 2014 को पुरालेखित. अभिगमन तिथि 20 December 2011. ↑ Leonard, Thomas. Encyclopedia of the developing world, Volume 1. Taylor & Francis, 2006. आई॰ऍस॰बी॰ऍन॰ 9780415976626. ↑ अ आ इ ई उ ऊ ए ऐ ओ "Indo-Pakistani War of 1971". Global Security. अभिगमन तिथि 20 October 2009. ↑ "The Sinking of the Ghazi". 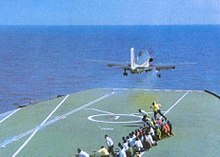 Bharat Rakshak Monitor, 4(2). अभिगमन तिथि 20 October 2009. ↑ "How west was won...on the waterfront". The Tribune. अभिगमन तिथि 24 December 2011. ↑ "India – Pakistan War, 1971; Western Front, Part I". acig.com. अभिगमन तिथि 22 December 2011. ↑ "1971 war: who lost what?". ↑ अ आ "Gen. Tikka Khan, 87; 'Butcher of Bengal' Led Pakistani Army". Los Angeles Times. 30 March 2002. अभिगमन तिथि 11 April 2010. ↑ कोहेन, स्टीफ़न (२००४). द आईडिया ऑफ़ पाकिस्तान. ब्रुकिंग्स इन्स्टीट्यूशन प्रेस. पृ॰ 382. आई॰ऍस॰बी॰ऍन॰ 978-0-8157-1502-3. ↑ "1971 War: 'I will give you 30 minutes'". Sify.com. अभिगमन तिथि 14 April 2011. ↑ अ आ इ ऑर्टन, ऍना (२०१०). India's Borderland Disputes: China, Pakistan, Bangladesh, and Nepal. एपिटोम बुक्स. पृ॰ 117. आई॰ऍस॰बी॰ऍन॰ 9789380297156. अभिगमन तिथि २०१६-०३-१०. ↑ Burke, S. M (1974). Mainsprings of Indian and Pakistani Foreign Policies – S. M. Burke. आई॰ऍस॰बी॰ऍन॰ 9780816607204. अभिगमन तिथि 27 July 2012. ↑ Bose, Sarmila (25 November 2011). "The question of genocide and the quest for justice in the 1971 war" (PDF). Journal of Genocide Research: 398. ↑ "जमात क्लेम्स डिनाइड बाए एविडेन्स" (अंग्रेज़ी में). द डेली स्टार. २८ फ़रवरी २००८. अभिगमन तिथि १० मार्च २०१६. ↑ हक़्क़ानी, हुसैन (2005). पाकिस्तान: बिटवीन मॉस्क एण्ड मिलिटरी (अंग्रेज़ी में). United Book Press. आई॰ऍस॰बी॰ऍन॰ 978-0-87003-214-1. , Chapter 3, p. 87. ↑ बुर्क, सैम्युअल मार्टिन (1974). मेनस्प्रिंग्स ऑफ़ इण्डियन एण्ड पाकिस्तानी फ़ॉरेन Policies (अंग्रेज़ी में). मिन्नेसोटा विश्वविद्यालय प्रेस. पृ॰ 216. आई॰ऍस॰बी॰ऍन॰ 978-0-8166-5714-8. ↑ ऍल्स्टॉन, मार्गरेट (२०१५). वुमेन एण्ड क्लाइमेट चेन्ज इन बांग्लादेश (अंग्रेज़ी में). रूटलेज. पृ॰ 40. आई॰ऍस॰बी॰ऍन॰ 9781317684862. अभिगमन तिथि 8 मार्च 2016. ↑ टॉट्टन, सॅम्युअल (2012). प्लाइट एण्ड फ़ेट ऑफ़ वूमेन ड्यूरिंग एण्ड फ़ॉलोइंग जीनोसाइड (अंग्रेज़ी में). ट्रान्सैक्शन पब्लिशर्स. पृ॰ 55. आई॰ऍस॰बी॰ऍन॰ 9781412847599. अभिगमन तिथि 8 मार्च 2016. ↑ मायर्स, डैविड जी. (२००४). एक्स्प्लोरिंग सायकोलॉजी ४ई (अंग्रेज़ी में). टाटा मॅक्ग्रॉ हिल एड्युकेशन. पृ॰ 269. आई॰ऍस॰बी॰ऍन॰ 9780070700628. अभिगमन तिथि 8 मार्च 2016. ↑ कैनेडी, सिनेटर एडवार्ड, "Crisis in South Asia – A report to the Subcommittee investigating the Problem of Refugees and Their Settlement, Submitted to U.S. Senate Judiciary Committee", १ नवंबर १९७१, सं.राज्य सरकार प्रेस, पृ.६६। Sen. Kennedy wrote, "Field reports to the U.S. Government, countless eye-witness journalistic accounts, reports of International agencies such as World Bank and additional information available to the subcommittee document the reign of terror which grips East Bengal (East Pakistan). Hardest hit have been members of the Hindu community who have been robbed of their lands and shops, systematically slaughtered, and in some places, painted with yellow patches marked 'H'. All of this has been officially sanctioned, ordered and implemented under martial law from Islamabad." ↑ Rummel, रुडोल्फ जे., "स्टैटिस्टिक्स ऑफ़ डेमोसाइड: Genocide and Mass Murder Since 1900", ISBN 3-8258-4010-7, अध्याय ८, Table 8.2 Pakistan Genocide in Bangladesh Estimates, Sources, and Calculations: lowest estimate 2 million claimed by Pakistan (reported by Aziz, Qutubuddin. Blood and tears कराची: यूनाइटेड प्रेस ऑफ़ पाकिस्तान, १९७४। पृ.७४, २२६), some other sources used by Rummel suggest a figure of between 8 and 10 million with one (जॉनसन, बी.एल.सी। बांग्लादेश। न्यू यॉर्क: बार्न्स एण्ड नोबल, १९७५। पृ ७३,७५) that "could have been" 12 million. ↑ अ आ Chatterjee, Pranab (2010). A Story of Ambivalent Modernization in Bangladesh and West Bengal: The Rise and Fall of Bengali Elitism in South Asia (अंग्रेज़ी में). Peter Lang. आई॰ऍस॰बी॰ऍन॰ 9781433108204. अभिगमन तिथि 23 December 2016. ↑ "विवेचना: याहया की अय्याशी की वजह से पाकिस्तान हारा था 1971 का युद्ध?". ↑ अ आ इ Lieven, Anatol (6 मार्च 2012). Pakistan: A Hard Country (अंग्रेज़ी में). PublicAffairs. आई॰ऍस॰बी॰ऍन॰ 1610391624. अभिगमन तिथि 23 December 2016. ↑ Abbott, David (2015). Changing World: Pakistan (अंग्रेज़ी में). Minnesota, U.S.: Encyclopaedia Britannica. आई॰ऍस॰बी॰ऍन॰ 9781625133212. अभिगमन तिथि 8 January 2017. ↑ Cochrane, Iain (2009). The Causes of the Bangladesh War (अंग्रेज़ी में). University of London: Lulu.com. आई॰ऍस॰बी॰ऍन॰ 9781445240435. अभिगमन तिथि 8 January 2017. ↑ et.al (1 June 2003). "Legal Framework Order 1970". Story Of Pakistan. Nazaria-e-Pakistan Trust, 2003. अभिगमन तिथि 23 December 2016. ↑ Nohlen, Dieter (2004). Elections in Asia and the Pacific (Reprint संस्करण). Oxford: Oxford Univ. Press. आई॰ऍस॰बी॰ऍन॰ 0-19-924958-X. ↑ Guha, Ramachandra (10 फरवरी 2011). India After Gandhi: The History of the World's Largest Democracy (अंग्रेज़ी में). Pan Macmillan. आई॰ऍस॰बी॰ऍन॰ 9780330540209. अभिगमन तिथि 23 December 2016. ↑ अ आ इ Ehtisham, S. Akhtar (1998). A Medical Doctor Examines Life on Three Continents: A Pakistani View. Algora Publishing. आई॰ऍस॰बी॰ऍन॰ 9780875866345. अभिगमन तिथि 9 December 2016. ↑ Ghazali, Abdus Sattar. "Islamic Pakistan: Illusions and Reality". ghazali.net. National Book Club,. अभिगमन तिथि 23 December 2016. ↑ D'Costa, Bina (2011). Nationbuilding, Gender and War Crimes in South Asia. Routledge. पृ॰ 103. आई॰ऍस॰बी॰ऍन॰ 9780415565660. ↑ D' Costa, Bina (2011). Nationbuilding, Gender and War Crimes in South Asia. Routledge. पृ॰ 103. आई॰ऍस॰बी॰ऍन॰ 9780415565660. ↑ Bose, Sarmila (8 October 2005). "Anatomy of Violence: Analysis of Civil War in East Pakistan in 1971". Economic and Political Weekly. मूल से 1 March 2007 को पुरालेखित. ↑ Salik, Siddiq, Witness To Surrender, ISBN 978-984-5-1373-4, pp. 63, 228–9. ↑ Riedel, Bruce O. (2011). Deadly Embrace: Pakistan, America, and the Future of the Global Jihad. Brookings Institution. पृ॰ 10. आई॰ऍस॰बी॰ऍन॰ 978-0-8157-0557-4. ↑ Qureshi, Hakeem Arshad (2003). Through the 1971 Crisis: An Eyewitness Account by a Soldier. Oxford University Press. पृ॰ 33. आई॰ऍस॰बी॰ऍन॰ 978-0-19-579778-7. ↑ अ आ इ "The U.S.: A Policy in Shambles". Time. 20 December 1971. अभिगमन तिथि 20 October 2009. (Subscription required (help)). 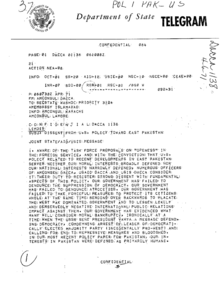 ↑ अ आ U.S. Consulate (Dacca) Cable, Sitrep: Army Terror Campaign Continues in Dacca; Evidence Military Faces Some Difficulties Elsewhere, 31 March 1971, Confidential, 3 pp. ↑ अ आ "East Pakistan: Even the Skies Weep". Time. 25 October 1971. अभिगमन तिथि 20 October 2009. (Subscription required (help)). ↑ International, Rotary (1971). The Rotarian (अंग्रेज़ी में). Rotary International. अभिगमन तिथि 23 December 2016. ↑ Bhutto, Fatima (6 सितंबर 2011). Songs of Blood and Sword: A Daughter's Memoir. Nation Books. पृ॰ 100. आई॰ऍस॰बी॰ऍन॰ 1-56858-712-0. अभिगमन तिथि 19 August 2016. ↑ Baixas, Lionel (21 June 2008). "Khan (1917–2002), General Tikka". Online Encyclopedia of Mass Violence. अभिगमन तिथि 17 July 2013. ↑ Alamgir, Aurangzaib (Nov–Dec 2012). "Pakistan's Balochistan Problem: An Insurgency's Rebirth". World Affairs. अभिगमन तिथि 17 July 2013. ↑ Col (retd) Anil Athale (29 August 2006). "Is Balochistan another Bangladesh?". Rediff India Abroad. अभिगमन तिथि 17 July 2013. ↑ Ahluwalia, A. (जून 2012). Airborne to Chairborne: Memoirs of a War Veteran Aviator-lawyer of the Indian Air Force (अंग्रेज़ी में). Xlibris Corporation. आई॰ऍस॰बी॰ऍन॰ 9781469196565. अभिगमन तिथि 23 December 2016. ↑ Haqqani, Hussain (2005). Pakistan: between mosque and the military. Carnegie Endowment. पृ॰ 74. आई॰ऍस॰बी॰ऍन॰ 978-0-87003-214-1. अभिगमन तिथि 11 April 2010. ↑ (arup), অরূপ (13 March 2010). "অরূপকথা: Interview of Major General Rao Farman Ali AKA "The Butcher of Bengal"". অরূপকথা. অরূপকথা. ↑ "The four Indo-Pak wars". Kashmirlive, 14 September 2006. अभिगमन तिथि 20 October 2009. ↑ "1971: Making Bangladesh a reality – I". Indian Defence Review. अभिगमन तिथि 21 जून 2015. ↑ Major K.C. Praval. Indian Army After Independence. Lancer Publishers LLC. पपृ॰ 1–. आई॰ऍस॰बी॰ऍन॰ 978-1-935501-61-9. ↑ Gary J Bass (1 October 2013). The Blood Telegram. Random House Publishers India Pvt. Limited. पपृ॰ 83–. आई॰ऍस॰बी॰ऍन॰ 978-81-8400-483-0. ↑ "I had to find troops for Dhaka". Rediff News, 14 December 2006. अभिगमन तिथि 20 October 2009. ↑ अ आ इ Hanhimäki, Jussi M.; Blumenau, Bernhard (2013). An International History of Terrorism: Western and Non-Western Experiences (अंग्रेज़ी में). Routledge. आई॰ऍस॰बी॰ऍन॰ 9780415635400. अभिगमन तिथि 24 December 2016. ↑ "The Hamood-ur-Rahman Commission". storyofpakistan.com/. Nazaria-e-Pakistan Trust, HRC. 1 June 2003. अभिगमन तिथि 23 August 2016. ↑ Ahmad, Dawood (16 December 2011). "Rethinking the big lies from 1971 – The Express Tribune". The Express Tribune. The Express Tribune, Ahmad. The Express Tribune. अभिगमन तिथि 23 December 2016. ↑ Ahmed, Khalid (26 December 2013). "Pakistan,1971". The Indian Express. Indian Express, 1971. Indian Express. अभिगमन तिथि 23 December 2016. ↑ अ आ Editorial (16 December 2014). "1971 'Jihad': Print ads from West Pakistan". DAWN.COM. Dawn newspaper, 2014. Dawn newspaper. अभिगमन तिथि 23 December 2016. ↑ "New Twist In "Crush India" Propaganda Campaign". US Department of State Telegram. 26 October 1971. अभिगमन तिथि 29 September 2011. ↑ Dikshit, Sandeep (28 June 2008). "How he and his men won those wars". The Hindu. The Hindu, Sandeep. The Hindu. अभिगमन तिथि 24 December 2016. ↑ अ आ Editorial Obituary (3 July 2008). "Sam Manekshaw: Sam Manekshaw, soldier, died on June 27th, aged 94". The Economist. The Economist, 2008. The Economist. अभिगमन तिथि 24 December 2016. ↑ अ आ Service, British Broadcasting Corporation Monitoring (1971). Summary of World Broadcasts: Far East (अंग्रेज़ी में). London, UK: Monitoring Service of the British Broadcasting Corporation. अभिगमन तिथि 22 December 2016. ↑ "Anti-India Demonstration and Procession". US Department of State Telegram. 9 November 1971. अभिगमन तिथि 29 September 2011. ↑ "Crush India" (PDF). Pakistan Observer. 30 November 1971. अभिगमन तिथि 29 September 2011. ↑ Mohiuddin, Yasmeen Niaz (2007). Pakistan: A Global Studies Handbook (अंग्रेज़ी में). ABC-CLIO. आई॰ऍस॰बी॰ऍन॰ 9781851098019. अभिगमन तिथि 24 December 2016. ↑ "Indo-Pakistani War of 1971". अभिगमन तिथि 20 October 2009. ↑ अ आ Davies, Peter E. (20 नवंबर 2014). F-104 Starfighter Units in Combat (अंग्रेज़ी में). Bloomsbury Publishing. आई॰ऍस॰बी॰ऍन॰ 9781780963143. अभिगमन तिथि 24 December 2016. ↑ "Bangladesh: Out of War, a Nation Is Born". Time. 20 December 1971. अभिगमन तिथि 20 October 2009. (Subscription required (help)). ↑ "India and Pakistan: Over the Edge". Time. 13 December 1971. अभिगमन तिथि 20 October 2009. (Subscription required (help)). ↑ "1971: Pakistan intensifies air raids on India". BBC News. 3 December 1971. अभिगमन तिथि 20 October 2009. ↑ अ आ Garver, John W. (1 दिसंबर 2015). China's Quest: The History of the Foreign Relations of the People's Republic of China (अंग्रेज़ी में). Oxford University Press. आई॰ऍस॰बी॰ऍन॰ 9780190261061. अभिगमन तिथि 24 December 2016. ↑ Goldrick, James (1997). No Easy Answers. New Delhi: Lancer's Publications and Distributors. आई॰ऍस॰बी॰ऍन॰ 1-897829-02-7. ↑ अ आ इ ई Goldrick, James (1997). No Easy Answers (PDF). New Delhi, India: Sona Printers, India. आई॰ऍस॰बी॰ऍन॰ 1 897829 02 7. अभिगमन तिथि 24 December 2016. ↑ Branfill-Cook, Roger (27 अगस्त 2014). Torpedo: The Complete History of the World's Most Revolutionary Naval Weapon (अंग्रेज़ी में). Seaforth Publishing. आई॰ऍस॰बी॰ऍन॰ 9781848322158. अभिगमन तिथि 24 December 2016. ↑ "Trident, Grandslam and Python: Attacks on Karachi". Bharat Rakshak. मूल से 26 September 2009 को पुरालेखित. अभिगमन तिथि 20 October 2009. ↑ Shabir, Usman. "The Second Missile Attack « PakDef Military Consortium". pakdef.org. Pakistan Defence, Usman. अभिगमन तिथि 24 December 2016. ↑ "Defence Notes". defencejournal.com. अभिगमन तिथि अप्रैल 25, 2012. ↑ Olsen, John Andreas (2011). Global Air Power. Potomac Books. पृ॰ 237. आई॰ऍस॰बी॰ऍन॰ 978-1-59797-680-0. ↑ "Remembering our war heroes". The Hindu. Chennai, India. 2 December 2006. ↑ 'Does the US want war with India?'. Rediff.com (31 December 2004). Retrieved on 14 April 2011. ↑ Pike, John. "Pakistan Marines (PM)". www.globalsecurity.org. Global security, Marines. अभिगमन तिथि 24 December 2016. ↑ "Utilisation of Pakistan merchant ships seized during the 1971 war". Irfc-nausena.nic.in. मूल से 1 March 2012 को पुरालेखित. अभिगमन तिथि 27 July 2012. 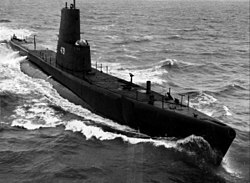 ↑ "Damage Assesment – 1971 Indo-Pak Naval War" (PDF). B. Harry. मूल (PDF) से 8 May 2010 को पुरालेखित. अभिगमन तिथि 20 June 2010. ↑ "Military Losses in the 1971 Indo-Pakistani War". Venik. मूल से 25 February 2002 को पुरालेखित. अभिगमन तिथि 30 May 2005. ↑ Tariq Ali (1983). Can Pakistan Survive? The Death of a State. Penguin Books Ltd. आई॰ऍस॰बी॰ऍन॰ 978-0-14-022401-6. ↑ "Indo-Pakistani conflict". Library of Congress Country Studies. अभिगमन तिथि 20 October 2009. ↑ "Picture Gallery – Aviation Art by Group Captain Syed Masood Akhtar Hussaini". PAF Falcons. अभिगमन तिथि 27 July 2012. ↑ Khan, Sher. "Last Flight from East Pakistan". www.defencejournal.com. Defence Journal, 2001. अभिगमन तिथि 24 December 2016. ↑ अ आ इ ई उ ऊ ए ऐ ओ औ Bowman, Martin (30 जनवरी 2016). Cold War Jet Combat: Air-to-Air Jet Fighter Operations 1950–1972 (अंग्रेज़ी में). Pen and Sword. आई॰ऍस॰बी॰ऍन॰ 9781473874633. अभिगमन तिथि 24 December 2016. ↑ Simha, Rakesh Krishnan (17 January 2012). "How India brought down the US' supersonic man". Russia & India Report (अंग्रेज़ी में). Russia & India Report. अभिगमन तिथि 24 December 2016. ↑ अ आ इ Jr, Karl DeRouen; Heo, Uk (10 मई 2007). Civil Wars of the World: Major Conflicts Since World War II (अंग्रेज़ी में). ABC-CLIO. आई॰ऍस॰बी॰ऍन॰ 9781851099191. अभिगमन तिथि 24 December 2016. ↑ Singh, Dipender (27 June 2008). "'Sam gave dignity to Army in 1971, after 1962 debacle'". Hindustan Times. अभिगमन तिथि 26 December 2016. ↑ Palit, Maj Gen DK (10 अक्टूबर 2012). 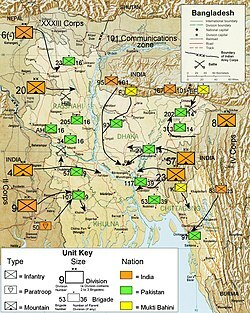 The Lightning Campaign: The Indo-Pakistan War, 1971 (अंग्रेज़ी में). Lancer Publishers. आई॰ऍस॰बी॰ऍन॰ 9781897829370. अभिगमन तिथि 24 December 2016. ↑ Hasnat, Syed Farooq (2011). Pakistan (अंग्रेज़ी में). ABC-CLIO. आई॰ऍस॰बी॰ऍन॰ 9780313346972. अभिगमन तिथि 24 December 2016. ↑ Goswami, Arvind (13 सितंबर 2012). 3 D Deceit, Duplicity & Dissimulation of U.S. Foreign Policy Towards India, Pakistan & Afghanistan (अंग्रेज़ी में). AuthorHouse. आई॰ऍस॰बी॰ऍन॰ 9781477257098. अभिगमन तिथि 24 December 2016. ↑ Alam, Dr Shah (12 जून 2012). Pakistan Army: Modernisation, Arms Procurement and Capacity Building (अंग्रेज़ी में). Vij Books India Pvt Ltd. आई॰ऍस॰बी॰ऍन॰ 9789381411797. ↑ अ आ इ ई उ ऊ Nair, Sreekumar (1 मार्च 2010). Interpretation (अंग्रेज़ी में). Pustak Mahal. आई॰ऍस॰बी॰ऍन॰ 9788122311112. अभिगमन तिथि 24 December 2016. ↑ Cohen, Stephen P. (21 सितंबर 2004). The Idea of Pakistan (अंग्रेज़ी में). Brookings Institution Press. आई॰ऍस॰बी॰ऍन॰ 0815797613. अभिगमन तिथि 24 December 2016. ↑ Sengupta, Ramananda. "1971 War: 'I will give you 30 minutes'". Sify. Sify, Sengupta. अभिगमन तिथि 24 December 2016. ↑ अ आ इ Naseer, Javed (26 अक्टूबर 2012). The Morning Echo: An Observation of Nature and Science (अंग्रेज़ी में). iUniverse, Naseer. आई॰ऍस॰बी॰ऍन॰ 9781475957082. अभिगमन तिथि 24 December 2016. ↑ Nayar, Kuldip (3 February 1998). "Of betrayal and bungling". The Indian Express. मूल से 23 August 2009 को पुरालेखित. अभिगमन तिथि 20 October 2009. ↑ "Huge bag of prisoners in our hands". Bharat Rakshak. अभिगमन तिथि 20 October 2009. ↑ "Turtuk, a Promised Land Between Two Hostile Neighbours". ↑ "An encounter with the 'king' of Turtuk, a border village near Gilgit-Baltistan". ↑ "A portrait of a village on the border". ↑ "Have you heard about this Indian Hero?". rediff.com. 22 December 2011. ↑ "The Simla Agreement 1972". Story of Pakistan. मूल से 14 June 2011 को पुरालेखित. अभिगमन तिथि 20 October 2009. ↑ "1971 India Pakistan War: Role of Russia, China, America and Britain". The World Reporter. अभिगमन तिथि 30 October 2011. ↑ अ आ इ Jackson, Robert (17 जून 1978). South Asian Crisis: India — Pakistan — Bangla Desh (अंग्रेज़ी में). Springer. आई॰ऍस॰बी॰ऍन॰ 9781349041633. अभिगमन तिथि 22 December 2016. ↑ अ आ VSM, Brig Amar Cheema (31 मार्च 2015). The Crimson Chinar: The Kashmir Conflict: A Politico Military Perspective (अंग्रेज़ी में). Lancer Publishers. आई॰ऍस॰बी॰ऍन॰ 9788170623014. अभिगमन तिथि 27 December 2016. ↑ Alvandi, Roham. Nixon, Kissinger, and the Shah: The United States and Iran in the Cold War (अंग्रेज़ी में). Oxford University Press. आई॰ऍस॰बी॰ऍन॰ 9780190610685. अभिगमन तिथि 27 December 2016. ↑ Hanhimäki, Jussi (2004). The flawed architect: Henry Kissinger and American foreign policy. Oxford University Press. आई॰ऍस॰बी॰ऍन॰ 978-0-19-517221-8.